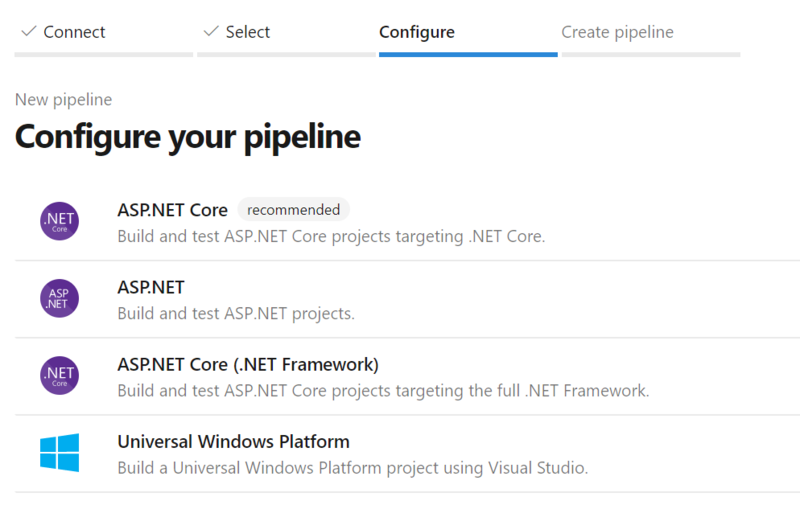 You can use Azure Pipelines to create automated builds for UWP projects. In this article, we’ll look at different ways to do this. We’ll also show you how to perform these tasks by using the command line so that you can integrate with any other build system. Begin by signing up for Azure Pipelines if you haven't done so already. Next, create a pipeline that you can use to build your source code. For a tutorial about building a pipeline to build a GitHub repository, see Create your first pipeline. 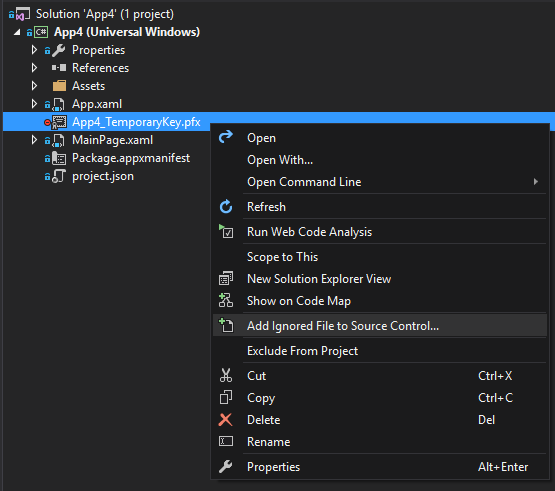 Azure Pipelines supports the repository types listed in this article. We’ll start with the default UWP build definition that’s available in Azure Dev Ops and then show you how to configure the pipeline. In the list of build definition templates, choose the Universal Windows Platform template. The default template tries to sign the package with the certificate specified in the .csproj file. If you want to sign your package during the build you must have access to the private key. Otherwise, you can disable signing by adding the parameter /p:AppxPackageSigningEnabled=false to the msbuildArgs section in the YAML file. Pipelines works with both Azure Repos Git and TFVC repositories. If you use a Git repository, add the certificate file of your project to the repository so that the build agent can sign the app package. If you don’t do this, the Git repository will ignore the certificate file. To add the certificate file to your repository, right-click the certificate file in Solution Explorer, and then in the shortcut menu, choose the Add Ignored File to Source Control command. This task compiles any solution that’s in the working folder to binaries and produces the output app package file. This task uses MSBuild arguments. You’ll have to specify the value of those arguments. Use the following table as a guide. AppxBundlePlatforms $(Build.BuildPlatform) Enables you to define the platforms to include in the bundle. 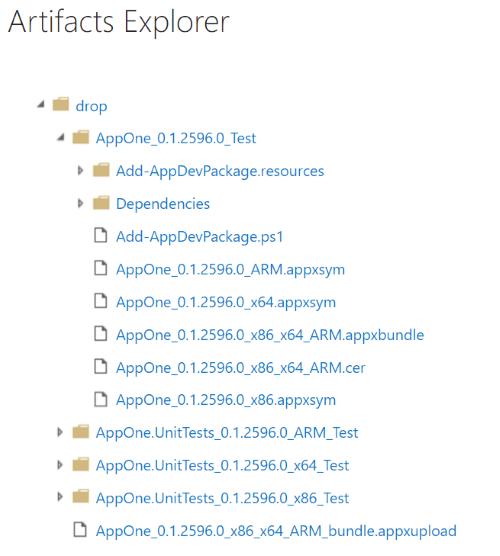 AppxBundle Always Creates an .msixbundle/.appxbundle with the .msix/.appx files for the platform specified. UapAppxPackageBuildMode StoreUpload Generates the .msixupload/.appxupload file and the _Test folder for sideloading. UapAppxPackageBuildMode CI Generates the .msixupload/.appxupload file only. If you want to build your solution by using the command line, or by using any other build system, run MSBuild with these arguments. The parameters defined with the $() syntax are variables defined in the build definition, and will change in other build systems. To view all predefined variables, see Predefined build variables. The default UWP pipeline does not save the generated artifacts. To add the publish capabilities to your YAML definition, add the following tasks. You can see the generated artifacts in the Artifacts option of the build results page. Because we’ve set the UapAppxPackageBuildMode argument to StoreUpload, the artifacts folder includes the package for submission to the Store (.msixupload/.appxupload). Note that you can also submit a regular app pacakge (.msix/.appx) or an app bundle (.msixbundle/.appxbundle/) to the Store. For the purposes of this article, we'll use the .appxupload file. If you add more than one UWP project to your solution and then try to create a bundle, you might receive an error like this one. This error appears because at the solution level, it’s not clear which app should appear in the bundle. To resolve this issue, open each project file and add the following properties at the end of the first <PropertyGroup> element. Then, remove the AppxBundle MSBuild argument from the build step.